1. 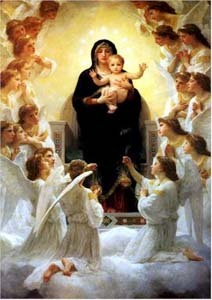 Whoever shall faithfull serve me by the recitation of the rosary, shall recieve signal graces. 3. The rosary shall be a powerful armor against hell, it will destory vice, decrease sin, and defeat heresies. 6. Whoever shall recite the rosary devoutly, applying himself to the consideration of its sacred mysteries shall never be conquered by misfortune. God will not chastise him in His justice, he shall not perish by an unprovided deathl if he be just he shall remain in the grace of God, and become worthy of eternal life. 7. Whoever shall have a true devotion to the rosary shall not die without the sacraments of the Church. 12. All those who propagat the holy rosary shall be aided by me in their necessities. 13. I have obtained from my Divine Son that all the advocates of the rosary shall have for intercession the entire celestial court during their life and at the hour of death. 14. All those who recite the rosary are my sons and daughter, and brothers and sisters of my only son Jesus Christ.